Wren has missed school to come to the Center, the sole surviving women's reproductive health clinic in the state, chaperoned by her aunt, Bex. Olive told Peg she was just coming for a check-up. Janine is undercover, a pro-life protester disguised as a patient. Joy needs to terminate her pregnancy. Louie is there to perform a service for these women, not in spite of his faith, but because of it. 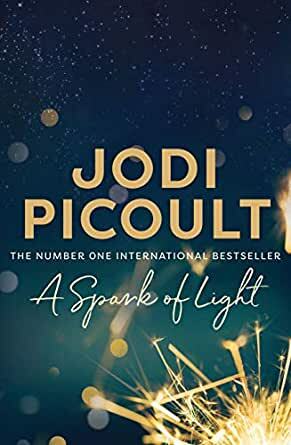 Jodi Picoult - one of the most fearless writers of our time - tackles a complicated issue in this gripping and nuanced novel. How do we balance the rights of pregnant women with the rights of the unborn they carry? What does it mean to be a good parent? A Spark of Light will inspire debate, conversation... and, hopefully, understanding. Picoult has a way of humanising complex issues, weaving the internal worlds of her characters and emotions into the complex web that makes up life and each individual choice within that life. This story presents both sides of the debate between people on both sides of abortion issue. It also shows its not black and white despite what ones say. The ramifications for a woman choosing to abort can sometimes reverberate throughout her life in her emotional self plus the ramifications for a child born to a woman who can't financially provide or emotionally be available for it plus a child who may not be wanted, or placed in foster system. So many lives affected by many decisions. Not all good or all bad but often weighted in despair and terror and aloneness and fear. The fear of being judged, abandoned, disowned - and excluded. Damned if you do, damned if you don't. An amazing heart wrenching story of multiple characters that stay with you long after you finished. This book begins with a hostage situation at the local Center. The Center is a place for women to go and get birth control, have gynecological examinations, and obtain abortions. There are those who do not want such a clinic in their community and there are those who are thankful that it is there. One day a man bursts into the clinic and begins firing. While a police hostage negotiator, Hugh is called to the scene. He has been getting a flurry of texts from his daughter and learns that she is inside the health clinic and is one of the hostages. He also learns that his sister is with Wren and has been injured. My least favourite of Picoult's book - reverse chronology got annoying, confusing number of characters (had to keep flipping back to remember who's who! ), and a disappointing read after so much anticipation. 3.0 out of 5 starsNewest book. Have been waiting a long time for a new book from this author, but do not feel that it was up to her brilliant others. Whilst I do agree which her subject, I found the manner of her writing and set out too confusing. I enjoyed reading the different women’s experiences and backgrounds. There are so many reasons that women make the choices. What concerns me is the lack of support for all women who become pregnant. The reverse chronological order was a bit of a headache. And so many characters. If you read the whole book in one sitting it wouldn't be an issue. But between work and study, when I did go back to it, it was difficult. I loved the topic content. Was well written. Hate the reverse chronology, now skipping pages just to find out what eventually happened. Otherwise it is boring & repetitive & not a patch on her earlier novels. Dont waste your money.